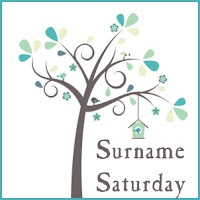 Another very important surname in my family tree is Sutton, so I thought that I'd spotlight this name for this week's Surname Saturday post. The name Sutton originates from the Anglo-Saxon words 'sudh,' meaning 'south,' and 'tun,' meaning 'town.' This equates to 'the family of southtown.' The name seems to have its roots in England and Ireland. For my family line, the most distant confirmed Sutton ancestor was John C Sutton, my 5th great grandfather. The earliest records for John C Sutton enumerate him on the 1820 Census in Randolph, Dearborn County, Indiana, along with a spouse, 6 sons, and 2 daughters. There is also a Joseph Sutton on that same Census, possibly a brother of John. It is believed that John was born in Pennsylvania, circa 1760-1770. There is an oral family tradition that John C. Sutton's family left Pennsylvania using a flat boat and floated down river from (or through) Pittsburg. Although some people in the family questioned this as a physical possibility, research has confirmed that many families moved to Ohio and Indiana in this manner. By the 1830 Census, John and his family are living in Switzerland County, Indiana. Switzerland, Ohio, Dearborn, and Ripley counties come together at just about the spot where John C. Sutton and his family lived. Per the "Switzerland Co., Indiana Marriages" (Scheur Publications, Warsaw, Indiana, 1994), at least 7 of John C Sutton's 8 children were married in Switzerland county between 1820-1836. This would include my 4th great grandfather, John D Sutton, who married Susannah "Susan" Dodge on 04 January 1827. 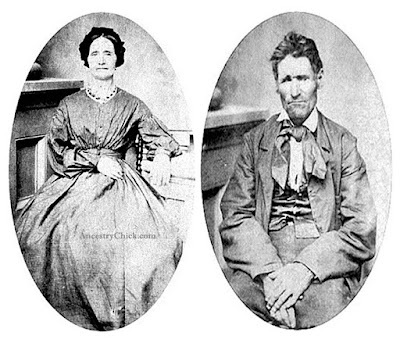 It is unknown as of yet to whom John C Sutton married, the mother of his children. There is lots of speculation among Sutton family researchers, but her identity remains a mystery at this time. And we really don't know much about John C either for that matter. More is known about my 4th great grandparents, John D and Susannah (Dodge) Sutton, who would also have 8 children. You can see these ancestors in the photos below, circa 1860. John D and Susannah's daughter, Jerusha Harmon Sutton, was my 3rd great grandmother. This family lived at various times in Switzerland and Ripley counties in Indiana, Rock Island County in Illinois, and Hardin county in Iowa. John D and Susannah would also later live in Vernon County, Missouri. The big mystery of John D Sutton is when and where he died. Family researchers are still on the hunt for definitive proof of his death. His wife's death was also somewhat of a mystery, until I discovered two small obituaries for her a year or so ago; one in the Cape Girardeau Democrat and one in the Kansas City Star from September, 1893. These showed that Susannah died in Vernon County, MO. Hopefully one day we'll discover John D's obituary too. And the hunt for my Sutton family ancestors continues. I too have a Sutton family. My 3rd Great Grandmother was Margaret Sutton 1792-abt 1845) She was the Daughter of Jacob Sutton and Ann Knox of Chester Co SC. This family has descendants in Butler and Logan Co KY, Bedford Co TN and Lawrence and Walker Co AL. They heavily intermarried with the Ferguson, Gaston, Eoff and Morrow family. 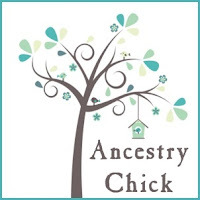 I've DNA tested at AncestryDNA and also have my results at FTDNA, GEDmatch and MyHeritage. I haven't found anything outside of unsourced mentions in online trees prior to SC. I believe they were in NC but some say prior to that the Suttons were in New Jersey. Hope to one day make the connection. So much of my Sutton line is a mystery. We hit a road block with mine at my 5th great grandfather, John C. Sutton, born 1770 in Pennsylvania. Most of the Suttons in my family lived in Pennsylvania, Missouri, and Indiana. But of course there could be other locations prior to all of that. My Sutton line will probably always be an ongoing mystery, but at least that keeps it interesting. :) Thanks so much for your comment, and I wish you luck with your continued Sutton research!